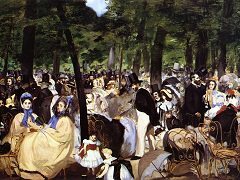 Edouard Manet, who is considered the link between Realism and Impressionism, painted this lively outdoor scene, Music in the Tuileries Gardens, of wealthy Parisians at their leisure. Men in dark jackets and light pants with top hats and women in fancy dresses and hats attests to the social status of the group. We can almost hear the music and the conversation. 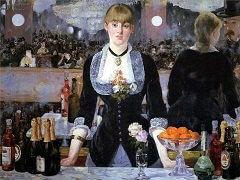 Coming from an upper-class family himself, Manet would be present at such events and this was probably his own experience. 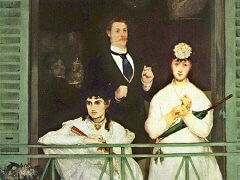 Leisure time and recreational activities like listening to music on a Sunday were all parts of modernity. Manet actually painted himself into this painting in the position of the flaneur, observing the crowd from the left front c orner. 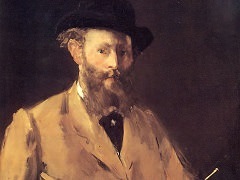 Manet came from a wealthy family and he was engaged with and knew his way around society, in this respect, he fit Baudelaire's description of a flaneur perfectly. 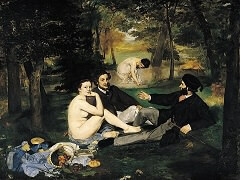 Like Courbet did in After Dinner at Ornans, he also incorporated his friends into the picture, Baudelair, Theophile Gautier and Baron Taylor as well as his brother Eugene Manet. 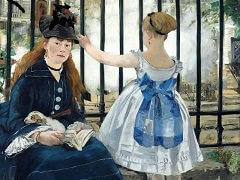 As much as looking for new expressions of art, Manet still wanted to be traditional. He was balancing to see how much he could breakdown tradition and get away with it. He still wanted to go through traditional channels for exhibiting his work and never wanted to exhibit with the Impressionists. A lot of people think of him as the'father of modernism.' The technique he used in this painting creates a really odd flatness. He removed the in-between, transitional tones and butted one color next to the other. Especially in the umbrella in the front, he used light and dark gray side by side just with a black outline. In his own way he is borrowing from and paying homage to Gustave Courbet in this work. The collective distraction that is present in this painting is very similar to Burial at Ornans. The little girls' elaborate dresses and the way they are playing in the ground recall the altar boys' standing on the left side of the Ornans painting. In Courbet's painting there is a sea of black which is for mourning, here the context changes to become men going out on a city day. The shock of red in the Beadles costumes in the middle of Courbet's painting is played off with the yellow and blue dresses of the women in the front. In both paintings, the main elements for each event is hidden, we don't see the body of the deceased for the funeral nor see the music for listening. The dog in Courbet is replaced by an umbrella in Manet and Manet's brother is in the position of the Veteran of 1783 in Courbet. 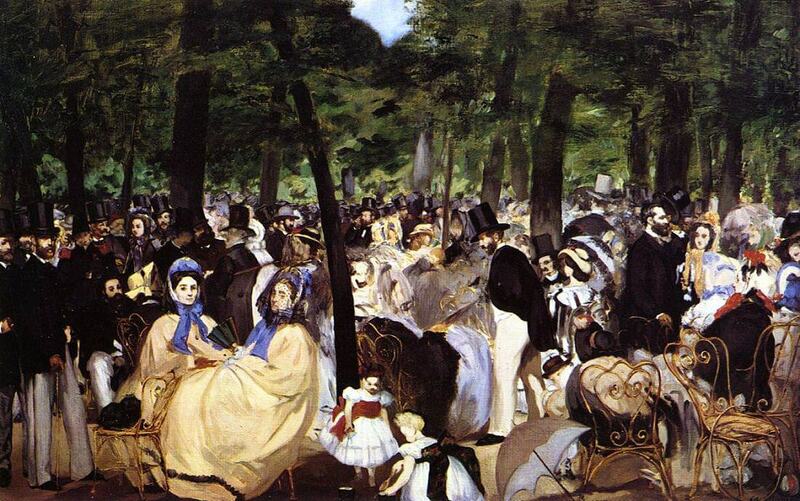 Manet's crowd is bigger than Courbet's and there is no sign of religion, it is a scene of leisure. The people are already gathered in Music at the Tuileries Gardens unlike the moment before the burial at Courbet's painting. There is also a difference in their palettes, Manet uses a light palette to suit the occasion and the sunny day is reflected in his tones of yellow, blue and white. While in A Burial at Ornans there is a huge sky up above, Music at Tuileries Gardens is packed full of trees. 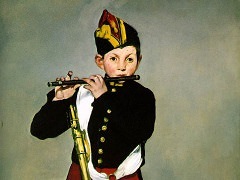 Manet liked to borrow from the past in his art while stylistically using modern techniques. In this painting he is acknowledging Courbet while leading the way for the young Impressionists with his sketchy brush-strokes, and light color palette. Overall, it gives us a great picture of the recreation of upper-class society in 1862 Paris.